You must be a member of the Amsterdam DinnerNations Group to attend this activity. Would you like to join this group? The biggest party of the year in The Netherlands! Kings day! 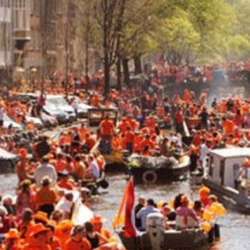 Amsterdam will coloring orange! We will organize a 5 hours boat trip. The location is near the Amstel Station and we will start at 14.00 hours. On board there is a huge ice cube and you can put your spotify play list on board. There is no toilet but we will stop several times. We will have beers, wines and soda (cola, juice and water) on board and chips and nuts. Beers, wines, soda and snacks are included. You can bring your own Bacardi or mixed drinks. In this activity we work with prepayment. After your registration you will receive a message. After cancellation you can only change your ticket with a non paid guest and manage it by yourself. Don't hesitate to contact me if you have any questions. After the boat trip we can have optional dinner at the Italian restaurant near the Amstel. Maximum capacity on board is 40, tickets will be given out on a first paid.